Following publication of this work , it was brought to our attention that seven of the mitochondrial COI haplotypes described in this manuscript as Spodoptera exempta haplotypes were in fact other species. These have been identified as Amyna punctum complex (haplo2), Chrysodeixis acuta (haplo4), Spodoptera triturata (haplo5), Vittaplusia vittata (haplo13), Condica sp. (haplo14) and Mesogenea varians (haplo15 and haplo16). As a result, we cannot now support one of our original conclusions suggesting that the Spodoptera genus does not appear to be monophyletic. The text describing and discussing this claim in the original manuscript  should be disregarded. However, it should be clearly stated that the main findings of the article, namely that the presence of Wolbachia appears to be driving a mitochondrial selective sweep within S. exempta, still holds true. Indeed, new analysis strengthens the extent of the skew. Here we present the results of the re-analysis with the corrected data sets along with revisions of the relevant figures. 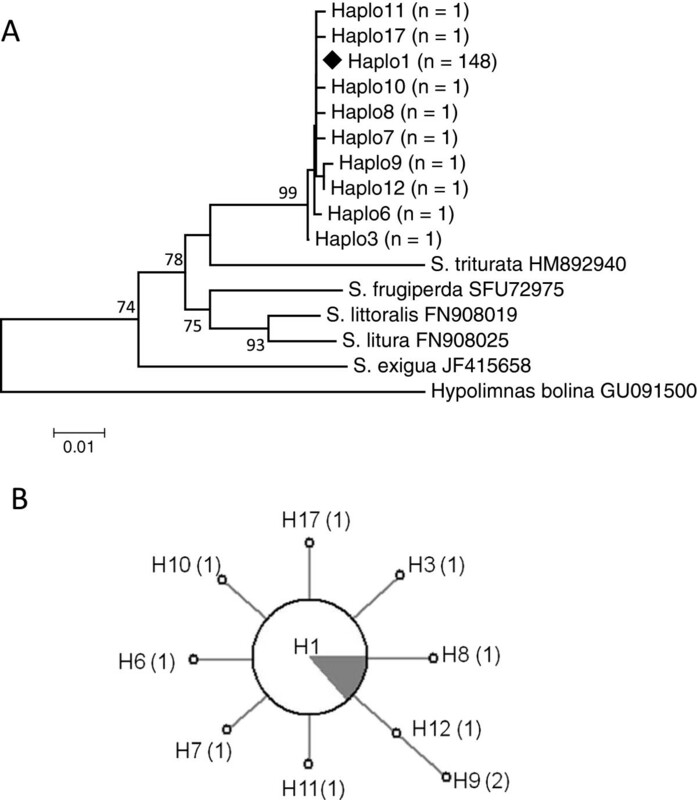 COI sequences were obtained from 157 S. exempta specimens and ten haplotypes identified [Genbank: JQ315120, JQ315122, JQ315125 – JQ315131, JQ315136; Figure 1]; 148 (94.3%) of the haplotypes belonged to haplo1. Significantly, all the Wolbachia infections detected in S. exempta were found associated with mtDNA haplo1, suggesting that recent selective sweeps associated with the invasion of Wolbachia may have affected mtDNA diversity in the armyworm population. The host COI haplotype diversity estimate was found to be very low (haplotype diversity, Hd: 0.112; nucleotide diversity, π: 0.0002). Estimates of D, D* and F* statistics were all negative for the COI gene (Tajima's D: -2.157, p < 0.01; Fu & Li's D*: -5.121, p < 0.02; Fu & Li's F*:-4.85017, p < 0.02). 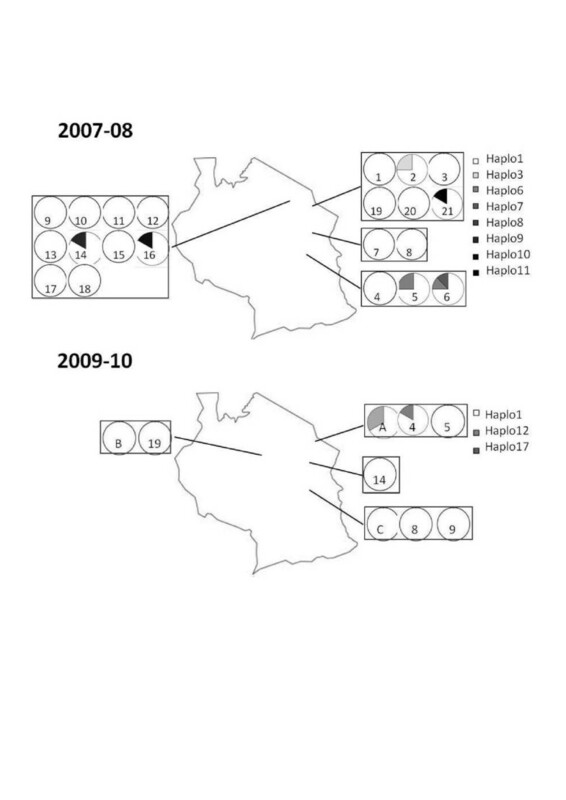 Apart from haplo1, all of the other haplotypes were very rare, each only detected in a single individual, making any inference on distribution-structuring or migratory behaviour difficult (Figure 2). A: Maximum-Likelihood (GTR+I model) phylogenetic tree of the mtDNA COI gene. Haplo1, the most common of the S. exempta haplotypes, is indicated by the solid diamond. The scale bar represents a 1% estimated difference in nucleotide sequence. Numbers given at each node correspond to the percentage bootstrap values (for 1000 repetitions). Replicate numbers of <60% were not included in the figure. The nymphalid Hypolimnas bolina is used as an outgroup. B: A network analysis displaying the skew and selection for mtDNA haplotype haplo1 (H1) within the S. exempta populations. The filled grey segment in the H1 pie-chart indicates the total percentage of Wolbachia infections in the samples, all found within haplo1 haplotypes. The most divergent haplotypes are found furthest from the centre, and brackets indicate the difference in nucleotide substitutions with haplo1. The spatial prevalence of COI hapolotypes within armyworm larval populations sampled throughout Tanzania over the course of two field seasons. The numbers correspond to the field sites in Table S1, numbered sequentially through the season. A, B and C refer to the moth trap catches from those districts. We wish to thank Dr. Scott Miller for bringing this matter to our attention.